With developing long years of experience nautical tourism, it is fully understandable why there is big demand for catamaran rentals in Greece. With that conclusion, we’ll draw out a few facts about catamaran yachts; above the catamarans are considerably larger than all other sailing boats. With large deck and spacious 4 cabins (two in every hull), they are made fully to give you the felling of relaxation and enjoyment of the beautiful Greek islands. The vast majority of catamarans in Greece offer a amazing and comfortable trampoline nets in the front of the boat, and shaded cockpit in the back. Rent a catamaran in Greece and find out why they offer superb sailing experience in Greece! We, at www.catamaran-charter-greece.com have all catamarans for charter in Greece. This includes smaller multihulls suitable for up 10 people and also large luxury catamarans with crew included. The crew can include Skipper, Hostess and Cook. Our multihull offer can be found here. Despite being very big, cats have shallow draft which is ideal for anchorage in secluded bays all over Cyclades islands. You can easily enter the shallow bays where most sailing yachts cannot, closer to the coast or a beach. Catamaran cruising is the attractive way to enjoy sailing without sacrificing comfort of your home with large cabins and bathrooms, big saloon with kitchen. IIn our additional offer we also have safety net that can be installed, so you can leave children on deck without fear of them falling overboard. 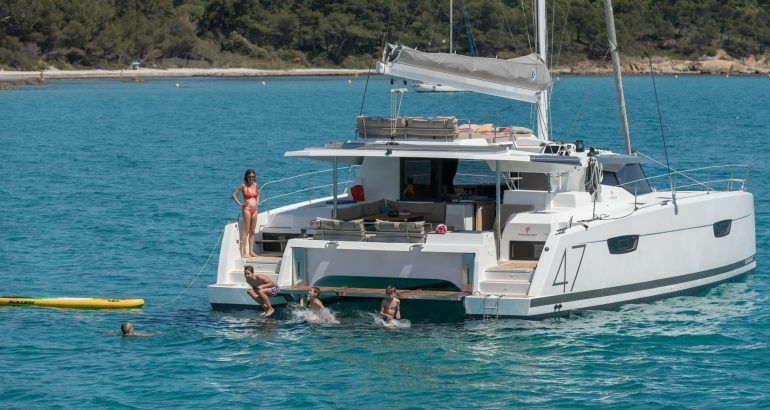 Catamarans are ideal for spending sailing holiday for families and friends. 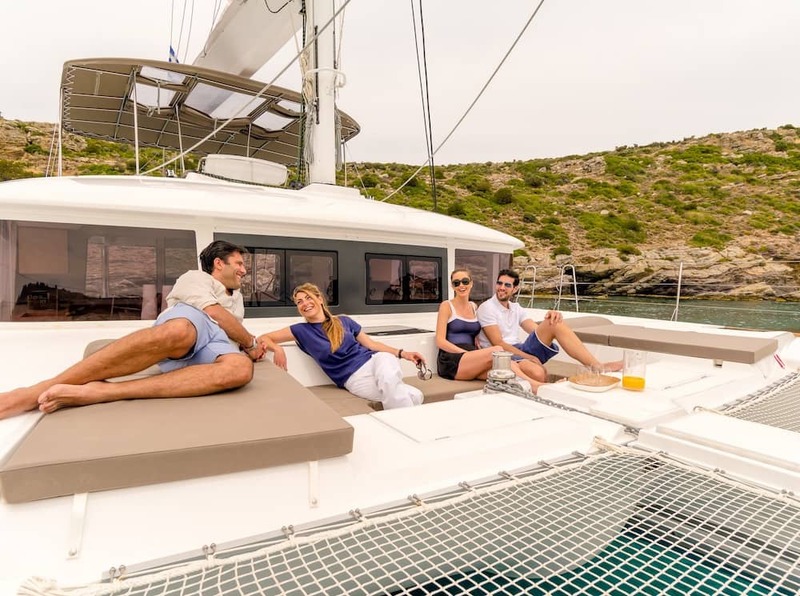 In Charter Catamaran Croatia fleet we have famous Bali 4.0 catamaran for rent, as well as other prominent models like Lagoon 39, Lagoon 380, Lagoon 400,, Nautitech 40, Bali 4.5, big luxury vessels Lagoon 50, Lagoon 52, Lagoon 620, Lagoon 560, Fountaine Pajot Saba 50 and the last one, the Bali 5.4. Catamarans for charter where not invented in Greece, as the main idea and design for double and triple hull boats existed for over 3000 years. It was used by fishing community paravas, at the southern coast of Tamilnadu, India. That’s why the word catamaran originates from the Tamil language, in which the word kattumaram means “logs bound together”. Later, these type of yachts (also known as cat boats) have been used for transport and fishing in the coastal waters of New England. At the beginning of 19th century multihulls were use for racing. In 20th century, catamarans are mainly used for charter, weekly sailing and leisure cruises. Catamaran Charter Greece offers catamarans for rent in Greece that can accommodate up to 12 guests in different combinations of cabins. Also depending on length, they have from 2 to 5 toilets/showers. Many of catamarans can be chartered bareboat / without crew (nautical license required), skippered and also fully crewed. As starting points for catamaran charter, number of cities and towns are available. Most popular among them are Athens, Lavrion, Mykonos, Santorini, Lefkas, Paros, Corfu, and other places across Greece coast & islands. Catamarans sail like a sailboats, but have a lot more advantages. Among many, comfort, security, stability and speed are main advantages. Having 2 hulls and 2 keels, catamarans are extremely fast, stable but most important SAFE. Considering that while sailing they have minimal slope, makes them perfect choice for people who do not tolerate waves and rough sea. As a result of the catamaran stability, you can experience more while sailing the Greek islands, regardless of the meltemi wind and waves or weather. Thanks to the large sail area and better stability, they generally can sail much faster than regular monohulls (sailing boats). They are equipped with two widely separated engines, and because of that are much easier to handle. Its very useful when maneuvering in tight marinas and small bays. It is reasonable to say that Catamarans for rent in Greece are perfect blend of pleasure and comfortable sailing all around Greece islands. Thanks to two separated hulls catamaran can offer more privacy and amazing views from the elevated salon that is located in the center of the catamaran. We could easily say that only setback when chartering a double hulled yacht is overall higher price and more expensive fees in harbors, buoys and marinas. We have to offer you more than 100 multihulls for charter in Greece, from renowned brands such as Fountane Pajot, Lagoon, Nautitech, Catana, Leopard, Privilege and also brand new in catamarans, Dufour. Catamarans are model of yachts / boats that have two hulls connected with large comfort middle area, equal in size. Their speed is very high, making catamarans a good choice for large distance of sailing at the Cyclades where you have a bigger distance from one island d to another. They are faster on average thank sailing boats monohuls. Thanks to their wide beam, they are less likely to capsize, but are often leaning to ‘pole-axe’ (or ‘pitchpole’) instead. Sailing school for licenses usually uses standard monohulls for teaching because they are easier for learning how to sail. Note: Because of high demand for Catamaran Charter in Greece, we advise booking catamaran at least 4 to 8 months in advance so you can get the best possible catamaran with early booking discounts! Because of there amazing design, catamarans top speed can be achieve when is not overly disrupted by the waves. It can be accomplish when the wavelength is considerable longer then the hulls, but can be also accomplish by braking the waves. In either case pitching (rocking horse-like motion) is reduced. Because of all this, catamarans are favorable in coastal waters. Catamarans are ideal cruising and long range boats because of there stability and because of that are favorite choice for every sailor that wants to come to Greece and sail the Cyclades islands. 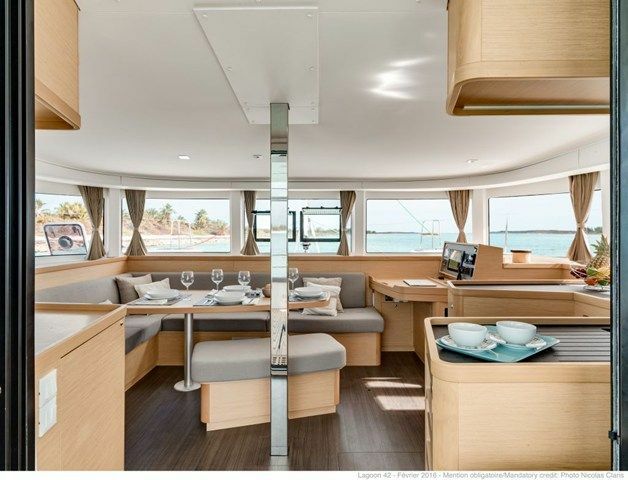 Over 45 feet long catamarans provide comfort with touch of luxury and lots of style. They are ideal for pleasant sailing vacation in Greece. Standard catamaran have 4 cabins and the larger models have 5 double cabins, with separate quarters in front of the hulls for the crew. There are also owners versions that have 3 cabins, with the layout of one large cabins with bathroom in one hull and two cabins with bathrooms in other hull. Prices for this kind of yachts are in range from 3.000,00 Euros up to 25.000,00 Euros per week charter in Greece. Sending the inquiry for a catamaran charter in Greece, our booking managers will send you our offer of yachts available in that specific week. Please fill the inquiry with all the details so we can send you the best possible offer.